In the spirit of connecting your phone’s activity to the cloud, a trend that has inspired one of this week’s more interesting launches, Phonedeck, there now comes another application that wants to automatically track your activity in order to provide a history of your communications, additional analysis, and even a search engine for your own life. The app is called Friday, and it’s now available in private beta (invites below) for Android users only. Friday comes from Dexetra, the same folks who brought you the Siri-like Android app Iris. They’re a team of six who got together in April 2010, and who recently raised a seed round of $200,000 just this fall. Their first app Iris is already seeing some decent traction – 1.7 million users have used it for some 75 million answers to date. With Friday, which now has around 55,000 sign-ups pre-launch, what you’re seeing is sort of like the flip side to Siri . Where you may ask your virtual assistant about things that will happen in the future (what’s my day look like? Can I get sushi nearby? ), you ask Friday about things that have already happened. The interesting thing here is not just that it has access to the history of your communications (phone calls, text messages, emails, etc. ), but that it also has access to other events, like photos that were taken, changes in the phone’s status (battery drops, e.g.) as well as activity taking place on third-party services (Facebook or Foursquare checkins, tweets, e.g.). No wait, I take that back. The really interesting thing that it has here is that it lets you query on those activities using natural language. Its same NLP engine is what was spun out to create the Iris, in fact. What having an NLP interface means is that later on, after Friday has created its index of your life, you could ask it to retrieve things like your all your photos from Las Vegas, all your calls from last week, or even which call you were on last week when the battery died on you. While the use case examples may leave you cold – how does knowing which call I was on when your battery died help me? The idea here is not the specifics, it’s about building something that starts to connect the dots. It’s about building a tool that not just collects and organizes your data, remembering everything for you, but also building a way to access that tool that you can just talk to or type in using everyday language, not traditional search queries. 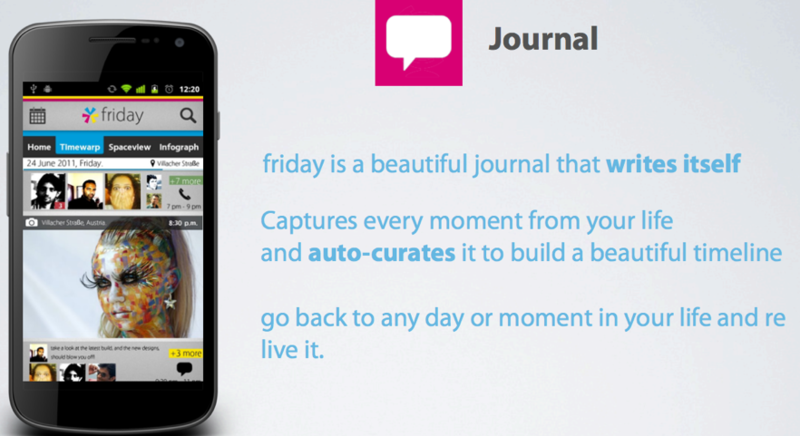 The user interface for Friday has come a long way since we first covered the app in its alpha stages last May. It’s more polished now, though still not as polished as something like PhoneDeck, however. The app still leans towards the geeky side of things, with sections titled “Timewarp,” and “Spaceview,” which are your personal timeline and a history of the cities you’ve traveled to, respectively. There’s also an “infograph” section, which, similar to PhoneDeck, gives you charts and graphs about the history of your communications (e.g. calls received, made, missed – that sort of thing). But in some ways, the app feels like an attempt to paint a user-friendly interface on top of a digital brain. PhoneDeck, meanwhile, is approaching the market more as a utility – here’s a dashboard, you can SMS from it or post to Facebook, you can sync contact details from PhoneDeck to all your devices, etc. With Friday, instead, it’s like seeing the underpinnings of a new kind of search engine getting dressed up in an Android’s apps clothes. What would be more interesting, in the long run, if the data generated through Friday served to complement the Iris app, which is still a much weaker alternative to Siri. Dextra CEO says it will be the other way around, however. Iris, connects with ChaCha (of all things!) and serves up Wikipedia-like answers on things like conversions, art, literature, history, and biology. Clearly, access to historical personal data could help beef up Iris’s appeal. And if Dextera could better integrate Iris/Friday with the phone to manage other things (talk to it to text a friend, place a call, add or view a calendar appointment, etc. ), it could even start to compete in the alt-Siri space. Friday is still in private beta. TechCrunch readers on Android can get an invite here.